Ogden on Politics: Evan Bayh Has "Charisma?" Russ Pulliam, columnist for the Indianapolis Star, today became the first member of the media to ever utter the name "Evan Bayh" and "charisma" in the same sentence. I about fell out of my chair reading Pulliam's column this morning. Bayh undoubtedly has a lot of positives as a political candidate, but "charisma" is not one of them. In fact, political pundits have often pointed to Bayh's lack of charisma as what has held him back on the national stage. When snooze-fest candidates like Al Gore and Joe Biden spark more excitement among their followers than Bayh, there is a definite charisma deficit. Charisma might not be that important to winning an Indiana Governor or Senate race, but it is critical to winning the Presidency. 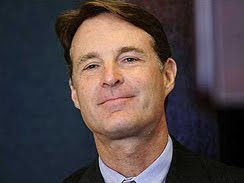 No, "charisma" and Evan Bayh do not go together. That's pretty funny. Pulliam and Bayh share the same degree of charisma, in my book. I have heard "bland" and"empty suit" (the latter which is a bit unfair since I'm sure the man is smart.) But I've never even heard admirers of Evan Bayh refer to him as "charissmatic. Even a label of 'excitable' would be more true than charismatic. "I do not think the word means what you think it means."